We are pleased to inform you that the Global Money Week for year 2017 will take place from 27 March – 2 April 2017! Global Money Week (GMW) is an annual global celebration, initiated by Child & Youth Finance International (CYFI), with local and regional events and activities aimed at inspiring children and youth to learn about money, saving, creating livelihoods, gaining employment and becoming an entrepreneur. For any questions, please do not hesitate to contact Miss Kimberly directly at kimberly@...! Warm greetings from the World Assembly of Youth (WAY) Headquarters in Melaka Malaysia! We are pleased to inform you that the 17th Melaka International Youth Dialogue with the theme ‘Our Roles in Solving Juvenile Delinquency’ will be held from 09th to 13th July 2017 in Melaka, Malaysia. This programme is organised by the World Assembly of Youth in collaboration with the Ministry of Youth and Sports (Malaysia), Melaka State Government, Asian Youth Council and Malaysian Youth Council. This theme has been selected to fulfill the principal opinions and roles of young people towards combating both juvenile violence and solving delinquent behaviors. Moreover, the outcomes guided by this selected theme are expected to contribute favorably in youth development as well as betterment of societies as a whole. An interactive dialogue on this topic will be of significance to form, educate, increase awareness on the challenges and entitlements of youth towards non-violence, peaceful and secure environment that assures and supports their development fully at the different levels of society that they represent. For more information on this dialogue, kindly refer to www.way.org.my/miyd. Should you require further details, do not hesitate to contact us. 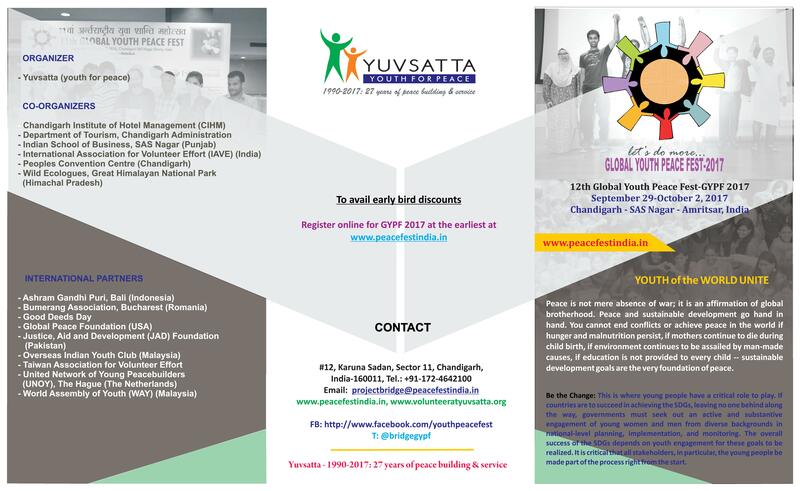 We are pleased to inform you that the Yuvsatta (Youth for Peace), in collaboration with the World Assembly of Youth (WAY), will organise the 12th Global Youth Peace Festival (GYPF 2017), ‘Youth of the World Unite – You Have Everything to Gain!’ scheduled to take place from September 29 - October 2, 2017 in Chandigarh – SAS Nagar – Amritsar, India. Over the past 11 years, the Global Youth Peace Festival has been pursuing the agenda of youth leadership and transformative change. It has also shown the way to build a global culture of volunteerism and service. 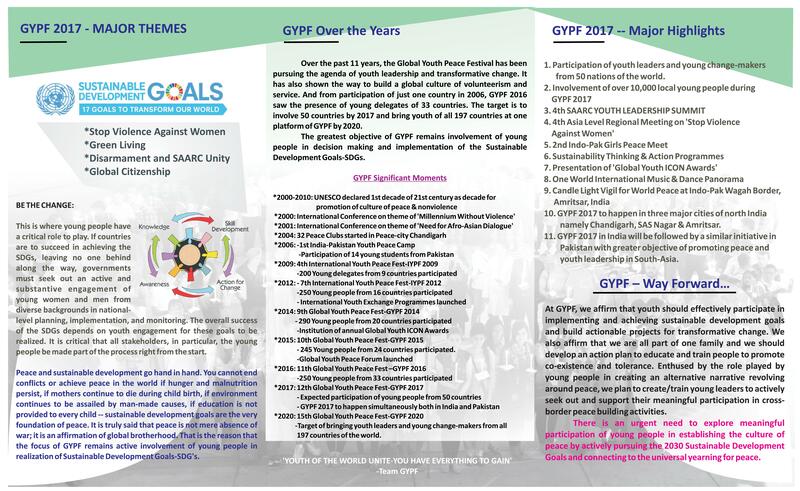 As was the case always at GYPF, GYPF 2017 will provide a platform for young people to be actively involved in decision-making and implementation of the Sustainable Development Goals (SDG) agenda. The SDGs are formally adopted by Heads of State at the United Nations marking a historic moment that sets the world’s development agenda for the next 15 years. If countries are to succeed in achieving the SDGs, leaving no one behind along the way, public sector must seek out an active and substantive engagement of young women and men from diverse backgrounds in national-level planning, implementation, and monitoring. The overall success of the SDGs depends on youth engagement for these goals to be realized. It is critical that all stakeholders, in particular young people, are included in the process right from the start. We would like to hereby circulate the attached tentative agenda for the 12th Global Youth Peace Fest (GYPF 2017). In general, the agenda of this inspiring event is given as follow. Day 1 - September 29, 2017 : Inaugural, Youth Panel Discussions, Global Youth ICON Awards with a cultural evening at Chandigarh. Day 4 - October 2, 2017 : Valedictory session at Peace-city Chandigarh.